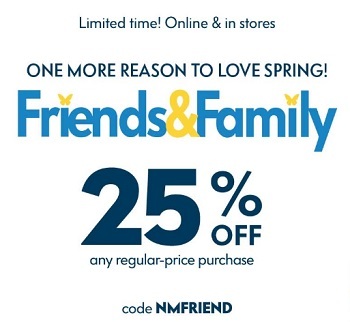 Here we come with details about U.S. Neiman Marcus Friends & Family Sale which is available during these days. Take 25% off your entire regular priced pruchase. This offer is valid at U.S. Neiman Marcus stores and U.S. Neiman Marcus online. To receive the offer use the promotion code NMFRIEND. For more details about the offer visit any U.S. Neiman Marcus store location or U.S. Neiman Marcus online.